Natural gas is a wise choice to power your appliances, offering efficiency, cost-effectiveness and low environmental impact. Gas appliances must be installed by licensed and certified gas pipe fitters, like Master Plumbing & Mechanical, to ensure years of worry-free natural gas delivery to your home. Considering that natural gas is widely regarded as the most efficient, reliable, and economical fuel to heat and power your home, it’s no wonder that natural gas appliances are becoming an increasingly popular choice for many homeowners. The variety of major appliances that can be powered by natural gas may come as a pleasant surprise. While natural gas appliances may initially cost more than their electric equivalents, the savings in energy cost over the life of the appliance can pay back the difference many times over. Natural gas furnaces heat your home faster and can produce air up to 25 degrees warmer out of the vent than an electric furnace. Natural gas water heaters can heat up to double the amount of water as an electric unit in the same time, cost less to operate and work even if the power goes out. 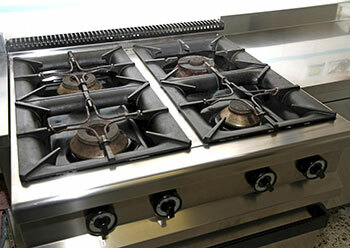 Natural gas stovetops cook evenly and can operate at a wide range of heat levels. Natural gas driers can dry clothes twice as fast as an electric unit, and use less energy. Natural gas fireplaces don’t require actual logs, but still offer the warmth and atmosphere of a real fireplace. Natural gas air conditioning is a recent breakthrough that is efficient and environmentally friendly. Natural gas space heaters help keep individual rooms warm and comfortable. Natural gas outdoor lighting can give your home a unique and charming look, while being functional and a snap to operate. Natural gas outdoor grills do not require propane tank refills and are ready to cook in an instant. Natural gas pool and spa heaters allow homeowners to enjoy their pools and hot tubs deeper into the winter, and heat the water twice as fast as an electric heater. Natural gas outdoor heaters keep the surrounding air about ten degrees warmer, so that homeowners can comfortably socialize on their patio even when temperatures dip. Natural gas fire pits don’t require a cumbersome and costly stockpile of logs, and safely bring the fun of a campfire to your patio. Natural gas generators can power many smaller appliances in the home, such as televisions and microwaves, in the event of a power outage. Master Plumbing & Mechanical services the Washington, D.C. metropolitan area. For natural gas appliance installation of all types, contact us for an estimate.